Is There A Place For The Mind In Physics? Part I : 13.7: Cosmos And Culture Is your Mind real, or just an afterthought in the life of your brain? What if the Mind was something as real as Space and Time and Higgs Bosons? Where does the mind fit within the cosmos? Are they separate, intertwined or one and the same? So I want you to do something for me. I want you to think of a blue monkey. Are you ready? OK, go! Visualize it in your head. Any kind of monkey will do (as long as it's blue). Take a moment. Really, see the little blue dude! Got it? Great. Now, here is the question: Where did that thought fit into reality? How was it real? Where was it real? Another way to ask this question is: Was the "blue monkey thought" just the electrical activity of your neurons? Was that all there was to it? If not, might your private internal screening of the blue monkey be something altogether different? Was it, perhaps, part of something just as fundamental as quarks and Higgs bosons? 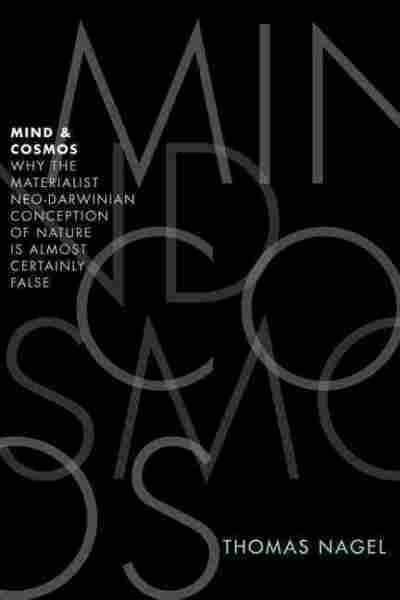 This is the fundamental question behind philosopher Thomas Nagel's controversial book: "Mind & Cosmos: Why The Materialist Neo-Darwinian Conception of Nature is Almost Certainly False". I've been slowly making my way through Nagel's short (though, at points, dense) volume for a few months now. Back in October our own most excellent philosopher of Mind, Alva Noe, presented his own take on Nagel's work. Yesterday, Tania Lombrozo extracted some real-world questions out of Nagel's philosophy. Today I want to begin thinking a bit about what and where the Mind might be in relation to my own science of physics. Before we go any further, though, we have to deal with Nagel's subtitle, which seems like the bad advice of a publisher intent on pushing sales. Nagel is a self-proclaimed atheist and is not using this work to push a vision of a Deity into the debate about the nature of reality at a fundamental level. His arguments are, for the most part, those of a philosopher steeped in philosophical tradition, laying out an argument that the Mind has its own unique place in the structure of the Universe. Still, Nagel bears his own share of blame for the over-heated title. In the early chapters of the book he attempts to cast doubt on the traditional Darwinian account for both the origins of life and the development of species. In these parts of the book he seems out of his league, relying on intuition rather than argument. Recently I've been reading the literature on the Origins of Life and the basic arguments, including the balance of probability and timescales, seem pretty clear and pretty honest (for an in-depth response to Nagel from a biologist see Allen Orr's cogent review in The New York Review of Books). Thus Nagel's arguments against Darwin in these domains appear to be a kind wishful thinking invoked to support the next, and most important, step in his thinking: the appearance of the Mind in the Cosmos. Nagel brings both intellectual heft and clarity to this question. Nagel's famous 1974 article "What is it Like to be a Bat" is a masterpiece of argument against the reductionist view that Mind is nothing more than an epiphenomena (word of the day!) of neural activity. Instead, Nagel argued that there is vividness to the internal experience of consciousness that cannot be reduced to an external account of matter and motion (i.e., neurons and electrical currents). Nagel's argument served as the springboard for in the philosopher David Chalmers' equally famous and influential discussion of "The Hard Problem of Consciousness". In that work Chalmers was unrelenting in distinguishing "easy" from "hard" problems in the study of the Mind. Easy problems, Chalmers said, were things like the intentional control of behavior or accessing the information in a system's internal states. Many of the easy problems are, of course, still quite hard but, in essence, seem to be computational in nature. The Hard Problem, in contrast, is all about the luminosity of experience, the private phenomenal realm so vivid to us all. From the Hard Problem's perspective, all the progress made in watching which parts of the brain light up in those famous MRI studies don't tell us much about consciousness. Instead, they only teach us about the neural correlates of consciousness. The neurons firing and the internal experience are two different things even if they are correlated. Most importantly, they don't really shed light on the central mystery of why, what, where and how the Mind arises, which are all questions Nagel really cares about. And if physical science ... leaves us in the dark about consciousness, that shows that it can not provide the basic form of intelligibility. There must be a very different way in which things as they are make sense, and that includes the way the physical world is, since the problem cannot be quarantined in the mind. That, my friends, is quite a claim. First, Nagel is saying we can't account for consciousness via the usual reductionist arguments that everything starts with quarks and then leads to Brains (and — ho hum — Minds too). Then he goes farther and claims that this failure infects the entire project of Science. Now, given that I'm a physicist, you might expect me to slam Nagel for being hopelessly lost in the weeds. The truth is, while I deeply suspect he is wrong, I do find his perspective bracing. Given his atheism, the question Nagel is really asking is stunning: Is there a fundamental place for the Mind in the fabric of reality? In its crudest form the question could be phrased: Might there be some "thing" we need to add to our picture of reality that we don't have now in order to embrace mind? This "thing" could be some kind of "consciousness particle" or "consciousness field". Anyone familiar with Philip Pullman's His Dark Materials novels will recognize "dust" as exactly this kind of new entity. Nagel would go much further than this kind of construct, however, adding a fundamental teleology — direction — to the development of the cosmic order that must come with the Mind. It's also worth noting at this point that Nagel is going far beyond Emergentism of the kind our dear co-blogger Stuart Kauffman has championed. From Nagel's point of view, consciousness did not emerge from the behavior of simpler parts of the Universe. Instead, the Mind is as elemental a part of the Cosmos as the fabric of Space-Time. Now, as 13.7 readers know, I am no fan of reductionism. In its grandest claims, reductionism tends to be more an affirmation of a faith then a tenable position about ontology (what exists in the world). However, as a physicist I am more prone to the Emergentist position because it requires a less radical alteration of what we believe does exist out there. Nagel's view asks for such a dramatic reworking of ontology that the evidence better be just as dramatic and, so far, it isn't. Still, once I got past Nagel's missteps on Darwin, I found his arguments to be quite brave, even if I am not ready to follow him to the ends of his ontology. There is a stiff, cold wind in his perspective. Those who dismiss him out of hand are holding fast to a knowledge that does not exist. The truth of the matter is we are just at the beginning of our understanding of consciousness and of the Mind. Think about the difference between Galileo's vision of "the real" and Einstein's. At this point in our study of the Mind, are we really so sure of what can, and what cannot, be simply dismissed? Nagel may ultimately be wrong, but he is correct in articulating one limit in the range of what might possibly be right.